Recommoning is the act of bringing the divergent files back together into the same physical disk image. An example of recommoning would occur when part of a development team, charged with developing advanced features for a project in parallel with the current work, must merge their work back into the projects mainline. Once the work on the new feature has been completed and tested, the new features can be rolled up into (recommoned) back with the main development code stream. To start this activity, use the Extract menu item and select the check out for Recommon option. 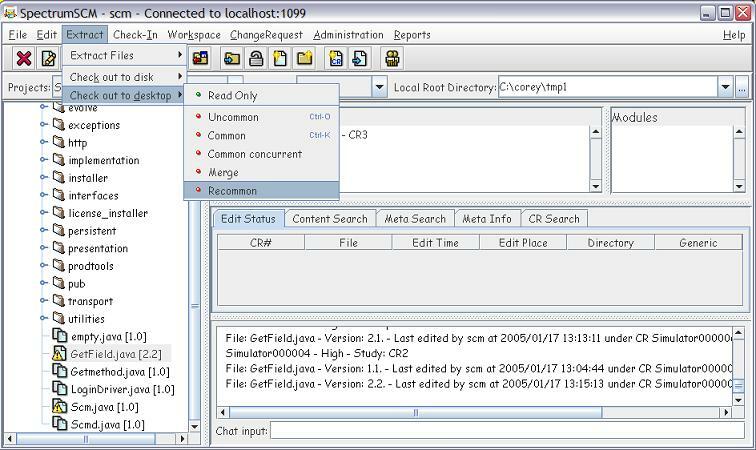 Use the SpectrumSCM Merge Editor to match the two files and complete the recommoning. 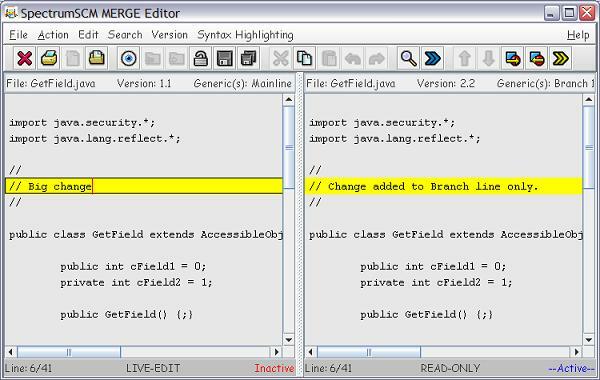 Use the multi-paned merge editor to add the changes in one file to the other. For a recommoning operation to be checked back in, both editor panes must match. Changes in the left hand pane must be reflected in the right hand pane and changes in the right must be in the left. Only after all of the editing differnces have been resolved will the check-in operation be allowed to proceed.